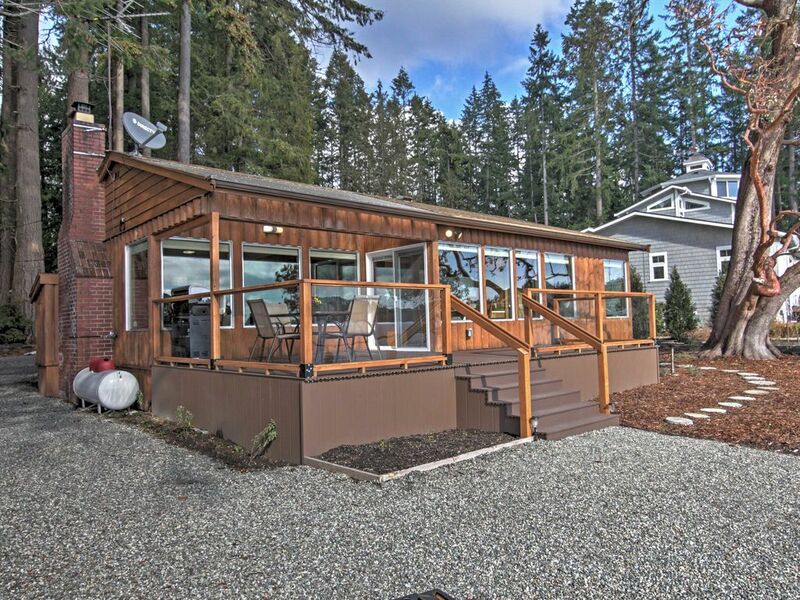 Experience tranquility on the shores of Poulsbo when you stay at ‘Hal’s Hideaway,’ featuring 2-bedrooms, 2 bathrooms and accommodations for 8 travelers throughout the waterfront property's main home and separate guest house. Just steps from the beach, this newly remodeled property is the perfect escape for those seeking a private getaway! Master Bedroom: Queen bed | Guest House: Queen Bed, Full Bed | Living room: Queen Pullout Bed. Pull into this beautiful property, surrounded by towering trees, and take in the unparalleled views of the water, mountains, and forests that surround it. Park to the side of the house and explore the backyard area, complete with a fire pit and exquisite balcony that overlooks Liberty Bay, and in the distance, Mt. Rainer. From the backyard, you’ll have easy access to the beach via your private staircase. Enter the house through the sunroom, where you’ll be welcomed by a charming, wood-paneled interior that emanates a cozy and welcoming cabin. Adorned with picture windows, the living room, which features a plush couch and loveseat, a gas-burning fireplace, and 50-inch flat screen cable TV, provides mesmerizing views of the surrounding natural beauty. Walk through the dining area into the well-equipped kitchen, where you’ll find ample counter space and cabinets. The dining table set for 4 will provide views unlike any other dining area. Just a few steps from the main house is a cozy and adorable guest house, complete with a second bedroom. This bedroom houses a 32-inch flat screen TV, DVD player, full-sized bed, and queen-sized bed. Need some fresh air? Put a burger on the grill and enjoy it outside on the deck or next to the fire pit, while enjoying a refreshing beverage. Explore the many peninsulas, beaches, bays and islands by taking scenic drives or renting a boat and traveling the area on the water! Visit the marina downtown to inquire about boat rentals. Poulsbo is a quaint town full of antique shops, local restaurants, and inspiring art galleries. Stop by Verksted Gallery and admire handmade gifts made by local artists before tasting different beers at Sound Brewery. Known as "The Little Norway," Poulsbo hosts a charming May festival as well as an Independence Day festival and celebration. If you're interested in testing your luck, drive 3 miles to Suquamish for the Clearwater Casino, or 15 minutes to the Point Casino in Kingston. From this superb location, you're only 10 miles from the ferry, which will take you to the heart of Seattle. Take a trip up to the top of The Space Needle and marvel at the 360-degree views of the sprawling city. - Fantastic location on Liberty Bay - Enjoy being central to many outdoor activities, as well as a short drive to downtown Seattle! Everything we needed for a great relaxing weekend. The house was well appointed and had everything we had hoped for, especially a great view. We are planning on staying again soon! Great place with a beautiful setting among majestic trees and sitting right on the water! This was a very comfortable home with everything we needed. The kitchen was well stocked for our needs, bathrooms were clean (the second bath was small but perfectly fine). The beds and linens were comfortable and the waterfront location and deck were amazing. The guest house was perfect for our older son allowing him some privacy and was heated with a wall heater that warmed the space perfectly (we were there in February and it was cold). This location is very convenient to downtown Poulsbo. TV, Internet, fireplace all worked perfectly. We had no issues with anything. This is a quaint, older “cabin” that has some updates and was absolutely perfect for us!! We will definitely be returning. It was exactly what it said it would be. So often we get to a rental and see all the things that don't measure up to the description. Not here. House and property extremely clean and well kept. All amenities, linens, cooking utensils and miscellaneous spices etc were there for our use. Super close and easy access to the beach and the view was great. Highly recommend this property. Great place to spend family time. We found this place out of necessity due to recently moving to the area and were pleasantly surprised by the beauty of this place! We totally fell in love with this cute hideaway with gorgeous views. We will definitely be reserving it again for family when they come to visit! !